What do you get when you mix investing with the largest social media network in the world? 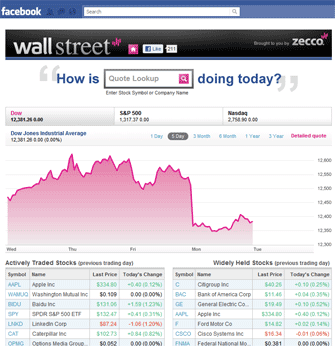 Zecco’s new Wall Street app for Facebook. Zecco has been known for years as one of the leaders in inexpensive trading and now they are taking it one step further by fully integrating their platform with the ever-growing social media king. The social aspect of trading stocks and investing isn’t a new concept, but this is the first true full Facebook platform. The app acts like a financial hub right from your Facebook page. It greets you with real time stats, quotes, and charts from the market, most actively traded stocks, and then you can dig deeper and get real time individual quotes. Obviously, from there you will have your traditional Facebook features: liking certain stocks, leaving comments on them, or sharing with your friends. But what makes this app really unique is the ability to place trades right from Facebook. That’s right, with a few clicks you can buy 100 shares of that new company one of your Facebook friends just recommended. I was told this is also patent pending technology, so it is, and will probably be the only broker to offer such a feature. I had some time to play with the new app after it was launched yesterday and I’ll walk you through some of the features. The best part is that this app is available to everyone. It doesn’t matter if you are a Zecco customer or not. Obviously, if you aren’t a customer you can’t place trades, but the rest of the app still functions as any other financial hub. After “liking” or installing the app you’ll be taken to the dashboard. The dashboard is where you’ll have access to a lot of the broad market data. You’ll see what the Dow, S&P 500, and Nasdaq are doing for the day and get a customizable chart. Below that you also have a list of the most actively traded stocks (delayed by a day) with their respective real time quotes. Clicking on them will take you to their detailed quote page. The dashboard on the right. Sure, getting a quick look at how the market is doing is nice, but the real power of the app is digging into the details. 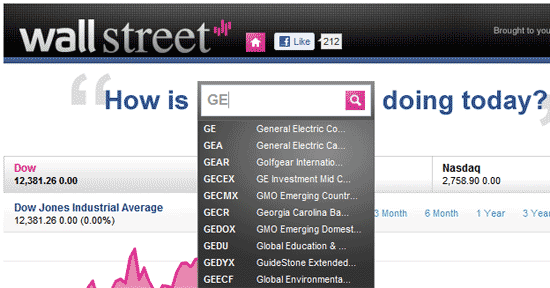 All you have to do is begin typing a stock ticker or company name and the Wall Street app does the west. As you can see, it populates your query with possible matches if you don’t know the full ticket or company name. That is pretty slick and it works fast. And finally, we have the meat and potatoes of the app where we get to see a detailed quote of the stock of our choosing. The layout should be pretty familiar if you’ve visited any financial site before. You have a quote at the top which turns red or green depending on the direction the stock has moved and a few different charts to choose from the bottom. Of course there are now a few other interesting data points for a particular stock. You can “like” the company as a whole at the top which then posts a link on your wall reflecting you like the stock. Below the chart you can leave a comment or see what others are saying about a particular company. Here you have the option to post your comment to your wall or not, it’s up to you. Then on the right you have a list of your friends where you can leave them a specific comment about this stock page. Finally, after you’ve researched your stocks or received recommendations from Facebook friends you can go ahead and place a trade without ever leaving facebook. When you click on the “Buy” or “Sell” icons at the top of a quote page a box with a secure connection will pop up. If you have a Zecco account just click the “Sign In” button and it will request your login credentials (again, securely) and give you the opportunity to set your order details. If you don’t have an account you can obviously click the link to open an account right on the spot as well. A few people have voiced concerns that since Facebook accounts can get hacked that it also means they can get into your Zecco account. No, they can’t. There is no physical link between Zecco and Facebook and you still have to login to Zecco from within Facebook to access your account. If your Facebook account was compromised all the person would see if they accessed your app would be the Zecco login box and be unable to do anything without those credentials. And here is a typical order screen after you have logged in. As you can see, it will allow you to set market, limit and stop orders, you can tell it how long to keep the order open, and all of that. 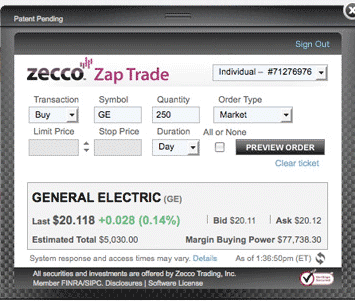 So it isn’t just a straightforward buy or sell market order and you get the flexibility you normally would if you were logged into your full Zecco account. So, what’s the verdict? For a Facebook app I would have to say this is top-notch. There are a lot of clunky, slow, and otherwise painful to use apps out there, but this isn’t one of them. Given the data, even real time, that this app has to work with it was incredibly responsive. Quotes loaded almost instantly. That was actually a surprise to me. If you are a regular Facebook user and also find yourself hopping over to Yahoo! Finance or Google Finance or something throughout the day, at the very least this app has merit whether you are a Zecco customer or not. It’s great to just click a link on your Facebook page and instantly get updated market information. The new social aspect of the platform will be nice, but it is in its infancy since the app was just launched. But as more people begin to use it and interact with others and leave comments about various stocks it should provide some interesting reading. 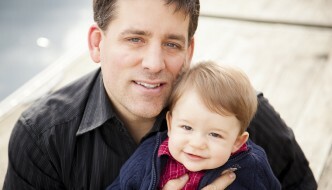 If you have some friends who also invest regularly it may also be useful to bounce ideas off each other via Facebook. It’s a quick way to get personal feedback. While the app is really slick and works wonderfully, there is a potential drawback. And that is if you are a typical long-term investor who doesn’t really dabble in individual stocks this app can make it tempting to trade stocks you otherwise may not have. For active traders it’s great because it makes buying and selling stocks easy. For other investors it’s bad because it makes buying and selling stocks so easy. Combine that with the excitement and influence you may get by reading comments people are leaving and it could have you taking on more risk than you’re accustomed to. So as always, you’d want to do your due diligence before placing any trades and try not to get overcome by any possible social media hype surrounding a company. So, as long as are comfortable with buying and selling individual stocks and think the added social aspect would improve your investing experience, I don’t think you can go wrong. If you’re just a casual market watcher and wanted to add stock data to your Facebook account then this is also a great and free app. 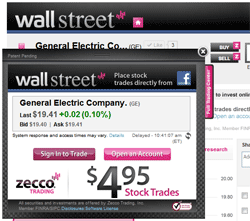 Check out the Wall Street application on Facebook or sign up for a free Zecco account today. It's good to have a chart to keep track of what's happening in the market everyday..
my buddy's ex-wife makes $88 every hour on the computer. She has been without work for seven months but last month her paycheck was $20148 just working on the computer for a few hours. Read more here ((((http://lazycash23)))). 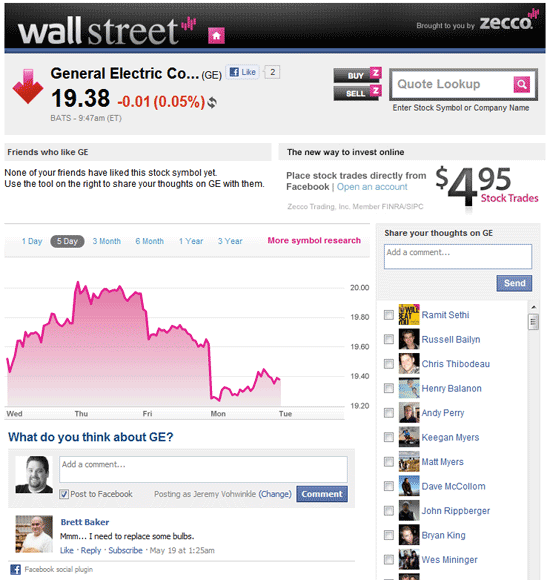 Hey Jeremy, thanks for a very complete review of the Zecco Wall Street app. I agree your final thoughts that this is dangerous for many investors and traders alike by making stock trading easily accessible. Having spent several years learning to trade before making consistent profits, the most important tool any investor or trader has to beat the market is education and experience. However, by making it easy to pull the trigger without any licenses or permits that even a 16-yr old would need to drive a car, investors are putting themselves in more danger than they are trained for. Not to say people shouldn't invest. They should be able to take control of their own finances, but they must be trained to do so correctly. It is in the broker's interest to make trading easy because a broker's income is based on commissions, so the more people can trade (and the more ways they can trade) the more a broker can make.